SEND ME A LITTLE POSITIVITY! You’re a strong, intelligent, professional – a superhero. You’ve spent years climbing the ladder, striving to be the “go to” person for all your clients and the person your team looks to you for answers. But in clocking up all that chargeable time you’ve missed far too many school plays, dinner dates and family gatherings. You can’t remember the last time you had a conversation with your spouse that didn’t involve negotiating who will be paying the cleaner or picking up the kids from school. Yet as you rush out of the office to finally make it up to your loved ones, you can’t help but feel that you aren’t giving your all to work either. Have you spent your career being the person you are expected to be? Are you fed up of not feeling able to be your “authentic self” or unsure who you really are, or what you want from life? Trying to be a superhero is causing us to burnout. So you reach for a glass of wine. But you know, that another glass of wine is not going to stop you waking in the middle of the night worrying about money, your relationship or whether you’ve washed the school uniforms. So you book another holiday. But you know a holiday isn’t going to stop you worrying about all those unread emails, and the inevitability of falling even further behind with your work and responsibilities. So you try yoga or golf. But instead of being ‘time out’, it feels like yet another thing on your endless to do list. You stay on the treadmill trying to keep everything moving, but any moment you are going to crash in a heap. You were supposed to be able to have it all… the career, the family, the lifestyle. Externally you laugh at having been sold a pipe dream, being told we could have it all, but deep down you wonder if maybe there’s something wrong with you. Do you feel you don’t have an identity outside of your career? Can you remember what hobbies you used to enjoy? Lawyer, coach & trainer, wife and mum to three amazing boys. I know what it’s like to wonder what’s missing when on paper life looks pretty perfect. On the one hand I had the new house, supportive husband, beautiful boys, successful legal business, but on the other hand, I felt like I was letting people down on a daily basis. I was living my dream life in many ways, but I certainly didn’t feel happy. I was surviving on temporary short lived, goal driven happiness and not experiencing lasting authentic happiness. So my search for that elusive work / life balance began and I learnt that authentic happiness was found inside and not from external circumstances. It is possible to wake up happy and excited to start the day, confident that you’ll cope with the daily stresses and still have energy left over for you, your family and your work. It’s possible to be successful and peaceful. Better yet, the answer doesn’t have to lie in running off to an ashram or quitting your job. By weaving some simple but powerful changes into your life you can start showing up happier, healthier and perhaps most surprising of all, so much more “successful” (on your own terms). The result – a career and family life that doesn’t just tick the boxes, but is fulfilling and rewarding. It’s my mission to help exhausted or frustrated lawyers to find their path. Being authentic to ourselves, our values and our goals, helps us in every area of our lives and work. “Be yourself, everyone else is taken”. That’s what Authentically Speaking is all about! It’s time to forget busy, and breathe! Whether you want to climb the corporate ladder or simply enjoy where you are with peace; I’ll show you how to do it without burning out. Take a few hours to reconnect with what’s really important, and learn tools that will help you feel happier, healthier and more successful. Get the support you need to make a real and lasting change, to master your inner game of authentic happiness. Presentations designed to encourage thinking about stress and happiness in a new way. Helping your organisation to take simple steps towards having less stressed, more motivated and more productive people. Only have a few minutes? Take a little time out to read some thoughts and observations from my journey to help professional women step out of busy, and into the life they thought they’d have by now. This was a day just for me, to think about me. Something I don’t think I should do normally, but I’ve realised, how important it is. Hannah has given me the tools to change my life! If you want to kick start your journey to self care, go to one of Hannah’s workshop. It makes you stop and take time to think about where you want to go. 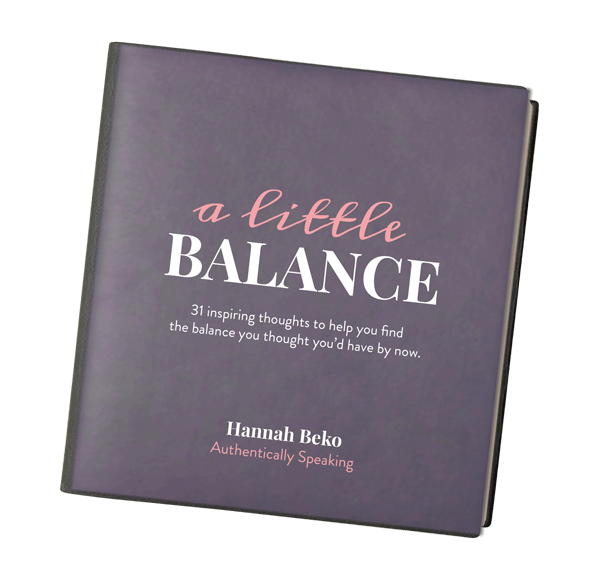 Are you ready to step out of busy, and into the balanced life you thought you'd have by now? Would working with me be right for you? Let’s have a quick no obligation chat about where you are now. Leave your details below, and I'll send you a thought from my book 'A Little Balance' every day for a month. No spam, no catches, just a slice of calm in your inbox. Thanks. Look out for an email confirming your email address! Would you like a little more balance? To receive a positive inspirational thought each day for a month, leave your email address here. A great start to your day!